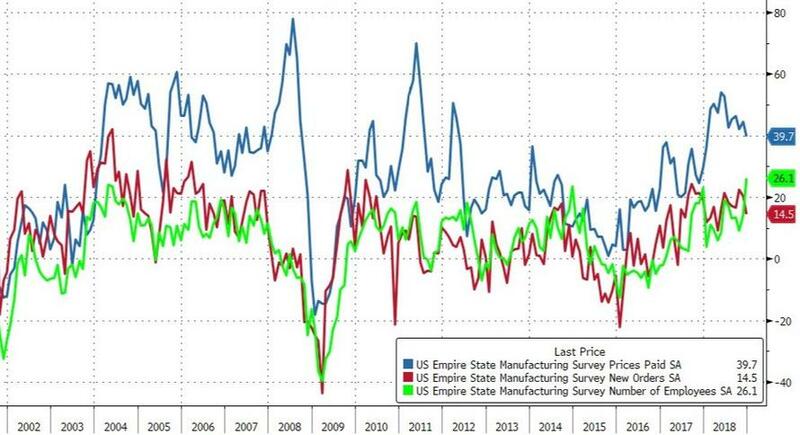 Hope-filled 'soft' survey data is starting to collapse back to the reality of US 'real' economic data and Empire Fed's plunge from 23.3 to 10.9 in December is the latest example. Against expectations of a small drop to 20.0, Empire Fed printed a worse-than-all-economists-estimates 10.9 in December - its lowest since May 2017 and the biggest MoM drop since Brexit. Prices Paid and New Orders tumbled but employment jumped to its highest on record?? Can The Fed ignore this shift in sentiment?